Win10 “Activity History” — misnomer or snoop? In Win10 version 1809 I don’t see a button to clear my Activity history (see screenshot). Apparently Chris is working with 1803 or an earlier version, where the Clear activity history option is at the bottom of the Activity History Settings pane. 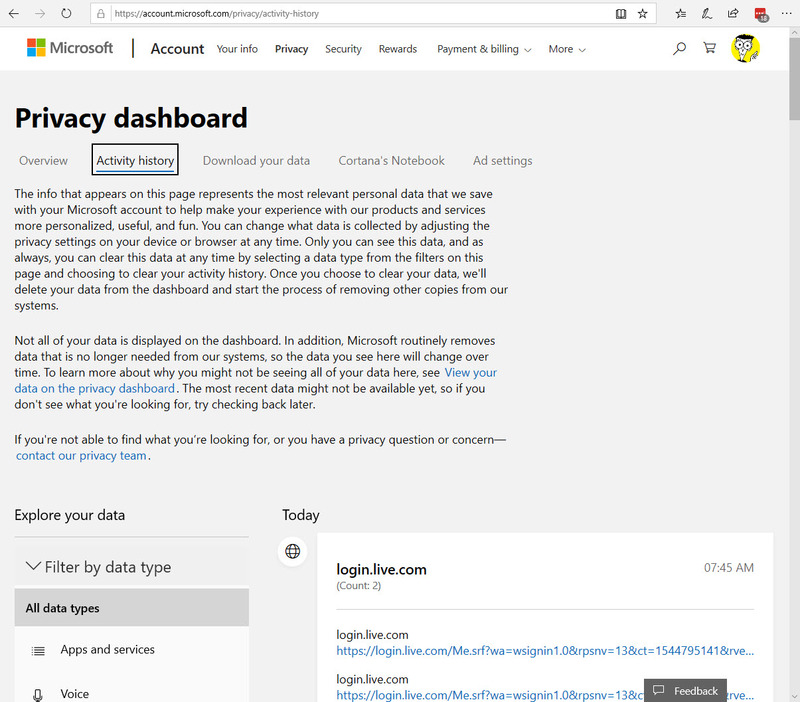 Windows 10 Activity History data is only a subset of the data displayed in the Microsoft Privacy Dashboard. We are working to address this naming issue in a future update. I’m sure there are some folks on the EU GDPR compliance team who’d be interested in that little, uh, misnomer. Any of you running Win10 1809… I’d sure be curious to know if you can find the Clear Activity History button. And… tell me again how Chromebooks are collecting so much more data than Windows machines? Home › Forums › Win10 “Activity History” — misnomer or snoop? “Activity History” = Windows should ask you if you want this on the first time you run Windows; and if you don’t check the “opt in” box, this should be completely off. And there should be ONE ICON on Control Panel allowing you to make the same decision at any time, including completely erasing your activity history both locally and on Microsoft’s end. Anything that is more complicated than that is unacceptable. Does this happen with local accounts, or just with Microsoft accounts? Only with Microsoft accounts. At least, the only way for a customer to tell for sure if the data has been collected is to log in to their Microsoft account. In my example, I have two Microsoft accounts active — only logged in to one of them — and the “activity history” is being stored for both accounts. Is Microsoft collecting “activity history” on machines running local accounts? Who knows? And there’s no way to verify. And that’s assuming Microsoft’s Privacy Dashboard is showing everything — which I think is giving MS the benefit of many doubts. If you have to log in to delete it, that’s like closing the gate after the cows got out! It’s already on their server and no telling how it’s been used/disseminated. And those who don’t use a Microsoft account have no way to delete it anyway. Someone mentioned/posted that when they install W10 from scratch, they have the WiFi and ethernet disconnected, so that all tricks and workarounds can be implemented prior to connection. A wise move it would seem in most cases. I’m assuming ‘activity history’ ties into Timeline? 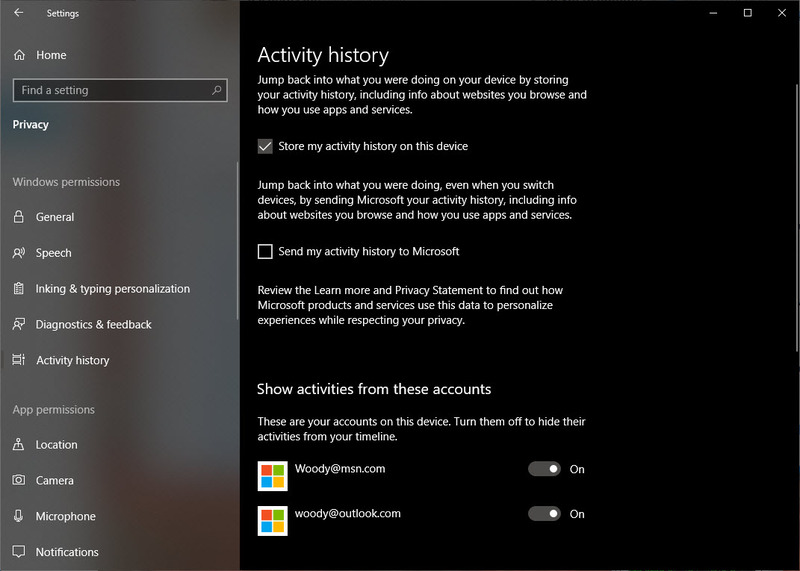 Is Microsoft collecting “activity history” on machines running local accounts? Who knows? And there’s no way to verify. No way? Perhaps not, but if there is no MS account at all for that machine, where would its data be collected? On the other hand, you can log in from anywhere to any MS account that does exist to check what has been collected under any of them now or in the past. In my case, having only a local account on my new machine, I just booted to a WinPE “rescue” environment and logged in to my old MS account. Nothing had been collected there since I cleared it all prior to setting up the new system with a local account only. 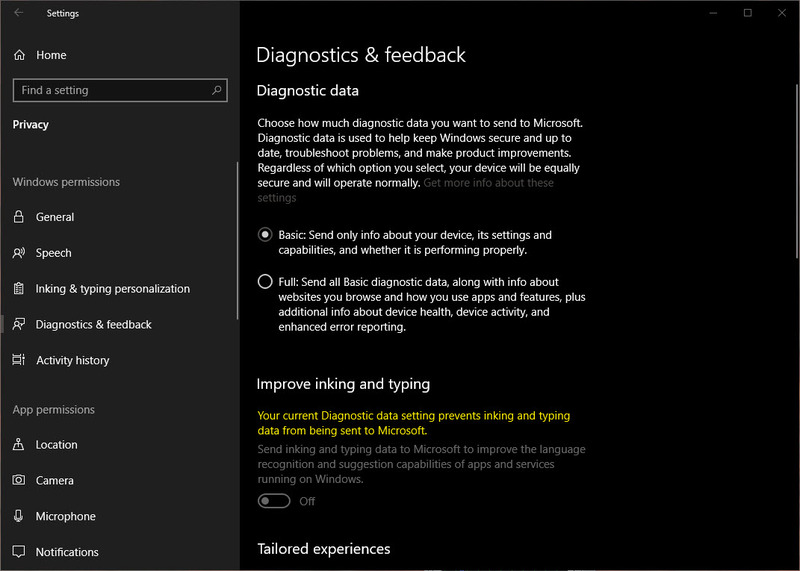 Enabling Activity History is prompted for during Windows 10 installation. As is the “Full”/”Basic” setting. The button is there in the current 19H1 Insider Preview build. The same setting is in 1809. With the opacity Microsoft has shown in the past four years, I have no faith in them actually doing what they claim to do, or not do. By means of a quick test (on 1809 17763.194), I just discovered that the Clear button only appears if Send my activity history to Microsoft is unchecked. Once that Send… is enabled the Clear button has disappeared when you revisit the Settings, Privacy, Activity history page. Good eyes “b”, I dislike those thin scrollbars and it took me awhile to find a setting in Ease of Access to make the scrollbars always wide, so that they are easier to see, and use. The thin, disappearing scroll bar is one of the single most annoying “features” of Windows 10. Matters are not helped by the fact that, even when fat, the scroll bar is a dim gray rectangle that requires extra effort to locate (and identify as such) on the screen. I still like the 3-D scroll bar used in earlier versions of Internet Explorer. In total, Win 10 looked good for a few days, then got uglier as the beer wore off. Not as stable, constantly updating, wishing most of it wasn’t trying to be cool with the touch screen set. The touch screen folks should have their own OS. Weird design. But now I see it. Thanks. I have just received a forced on me update to 1809 and can report that the “home” version also provides a screen with a clear history button that is active and check boxes for “store” and “send”. So many exceptions to their own rules. So many interpretations of the word truth. I don’t trust them, Google or Microsoft, and I can’t verify anything.This is just another straw on the camel’s back. What’s a person to do, don’t give them any information at all, block all telemetry. Google and Windows joining hands soon on a browser (shudder) Danger Will Robinson, Danger! Pointing out “see, they do it too” doesn’t make anything better. Edit to add: Linux is looking better and better. With Google, I can avoid them mostly by not using their services. That could be a pain at times but there are other search engines, browsers, email providers, etc. in the wild that do take privacy seriously. These often do a capable job for most so other than inertia and the general painfulness of migrating email from Gmail one can be Google free in an afternoon. When the OS provider sinks to scumware provider levels of behavior that is a much harder issue to avoid. Because to ditch an OS will require much more planning before migrating to another, finding and copying all your data, photos, bookmarks, etc. ; determining which programs have a usable substitute; is the hardware capable of running the other OS. Not trivial and possibly not cheap either. MS by sinking to scumbag levels is actually looking to get hammered by someone hard. And this is an unforced error. to ditch an OS will require much more planning before migrating to another, finding and copying all your data, photos, bookmarks, etc. ; determining which programs have a usable substitute; is the hardware capable of running the other OS. Not trivial and possibly not cheap either. Looking at it from another angle: Once you ditch an OS, you are unlikely to come back, whereas with Google’s services, you can take them or leave them as desired. I concur with Bluetrix, but I walked away from the “lesser of two evils” dilemma some time ago. Linux has been generally simple and easy, and can be installed with little effort along side Windows. I really enjoy AskWoody and regularly recommend it to friends for the great insights, but the promoting of Google is the exception. I always use only a local account. I recall reading somewhere that MS still tracks activity by tying the telemetry to the device ID. If that’s true, it seems quite possible that when I DO sign in to Microsoft – say to deal with my hotmail account – MS could easily link device ID to my identity. Yes? No? If you don’t see that key, then simply create it by right clicking in any blank area in that window and choose New > DWORD (32-bit) Value and set to 0.
restart PC to take effect. “Activity History” = Windows should ask you if you want this on the first time you run Windows; and if you don’t check the “opt in” box, this should be completely off. Totally agree but good privacy and the inability to snoop on unsuspecting or uncaring users would more than likely lead back to users paying for Windows. I wonder a Windows Private subscription would cost? But the question remains: In spite of how you set everything, and in spite of what Microsoft says, how much data are they really collecting? And what kind of data? My guess is that it is data that are needed for making Windows work better and more securely; but how can we be sure? * Microsoft interpreting the red X as the user wanting to proceed with the upgrade. * Microsoft upgrading my father-in-law’s computer from 7 to 10 without his knowledge or consent, and bricking his computer in the process. Hmmm. In one breath, on the inhale you say you trust Microsoft’s data collectio, and on the exhale you give two reasons not to trust Microsoft for things they have done. Fact: They are devious and outright lie. But you are correct; I had a positive tone on the inhale, and a negative tone on the exhale. I guess what that means is that my brain is telling me that everything is probably ok; but my heart is telling me that maybe it’s not. One thing I am certain of: Microsoft isn’t nearly as bad as Google. I guess. 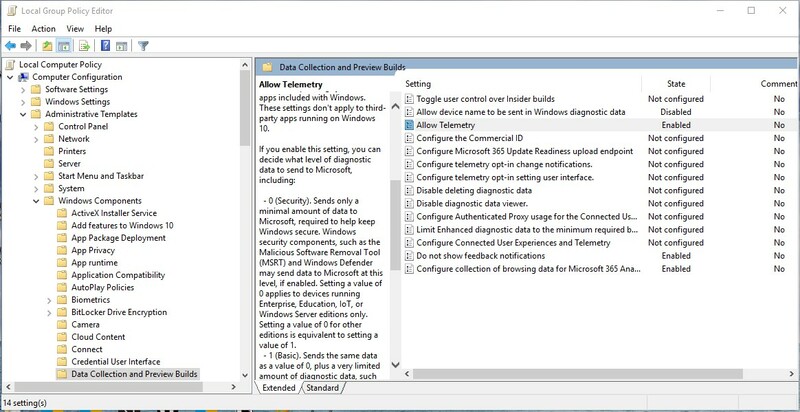 Shawn Brink at TenForums has a how to on enabling/disabling Activity History. That just does the Settings, Privacy, Activity History Store/Send settings for all users. What version of Windows 10 is this in? It is not in 1709. I changed the Windows registry (Windows Metrics) years ago on every OS I’ve had to enable fat scrollbars in Windows and browsers (except for Vivaldi where I had to install an app to give me wide scroll bars). It’s maddening that File Explorer in 1709 has the fat scrollbars and so does IE 11 but Settings has those tiny plus disappearing bars on a 24″ Dell Ultrasharp monitor! That is so insulting of Microsoft to believe no one has great desktops these days with large, widescreen monitors. this following link is for 1803 I think, but at the end / bottom, the Registry Edit might work for you. Beware, I am always afraid of editing the big scary “Registry” so do be careful and make backups, Create a New System Restore Point, export the current Registry to a safe place, make a full system image backup, you can see that I am of the ‘paranoid’ type. Anyway if you are comfortable editing the Registry these instructions may help, I do not know. scroll down for the registry edit instructions. HTH Lars220. What version/s of Windows 10 is Activity History in? I have 1709 and it is NOT in it. The setting is NOT there. I have Diagnostic Data set to Basic (had it turned off totally until Microsoft tried to force 1803 on me so I set it to Basic. Plus, I use a local account. Also, I just signed in to my Microsoft Account and checked and NOTHING in any category is there. I rarely use Edge, have Cortana disabled, and use a Local Account on 1709. I do use the Microsoft Store to get themes but no activity in Microsoft Store showed up either. I’m finding it frustrating that few folks anywhere mention what version of Windows 10 they are using…it matters and that should always be stated. Why would anyone with brains set telemetry to “Full”? I get it if Microsoft wants information to help fix my PC, but installing what may very well be a secret keylogger and a secret screen recorder onto my computer is going way too far. This, right here is (one of the reasons) why I won’t be using Windows 10. My data is NOT theirs. I don’t know why the heck they think they can just take whatever they want. It’s that sheer arrogance that just really does it for me. Also I customise, but I just don’t have the time to sit turning off ALL these options, there’s far too many and always at risk of resetting when it updates, the control is completely removed from the user, and I don’t like that. My W7 is set up how I want, looks how I want, does exactly what I want, doesn’t complain, doesn’t do anything IT wants to do, and doesn’t have billions of settings I need to turn off just so MS doesn’t download my entire brain. Even if games stop supporting W7 then eh, I’ve got enough in my backlog anyway so I’ll be fine, will just have to be more security vigilant post Jan 2020. Either they back the heck off, or come up with something better. Either ways I’m not interested in their c*** they’re currently peddling. I want to BUY a product that works for me, not them. I suspect that a needed Service might not be running, from the network icon shown, there should be a Troubleshooter attached, try to run that if you feel the need to ‘fix’ it. Thanks, I suppose I should run through my event viewer and see if it caught anything but when I woke up this morning the yellow caution was gone from the network icon in the taskbar. I guess as long as they don’t make a habit of it… Not that I’d rather have a benign problem replaced with a real one, you understand. I ran into the exact same thing on a Win7 machine after this month’s updates. It may be MS is doing the same thing with all of the updates. Really not much to add to the excellent advice above, depends basically on what you want and what you are comfortable with M$ is going to have some idea what your up to albeit the full picture or just a rough idea. Even Pro users will find that there’s limitations here unless your on the Win10 Ent,Edu editions key here is to read the confusingly worded (by design??) notes in the left side column. Horror of Horrors I do allow Telemetry at a basic level, occasionally since 1511 threshold 1 or 2?? some stuff didn’t always work right disabling Telemetry. For M$ account holders get on to a local Account if your concerned or next install just go “Local Account” if you need some of the Apps the requires an M$ sign in then do it on a per App basis, again read carefully before as M$ will try its darnedest to get you back in to the fold again. Obviously Syncing across devices is handy but Req’s you to go with an M$ Account take over, Mail and Calender and One drive all work on a per App basis, Mail and Calender will work across devices with out Syncing and even with Office Outlook 2010/16/19 just fine. Going through all your settings Locations another strange one, I use weather so obviously the UWP Weather App needs location (same for weather settings in Calender) if you connect via Wireless your location is very accurately triangulated to within feet in Maps (so if your a budding James Bond or are on the run don’t turn this on lol 😉 ) Connecting via Ethernet/Router has me, leastways, on the other side of town. this following link is for 1803 I think, but at the end / bottom, the Registry Edit might work for you. Beware, I am always afraid of editing the big scary “Registry” so do be careful and make backups, Create a New System Restore Point, export the current Registry to a safe place, make a full system image backup, you can see that I am of the ‘paranoid’ type. Anyway if you are comfortable editing the Registry these instructions may help, I do not know. https://winaero.com/blog/make-scroll-bars-always-visible-windows-10/ scroll down for the registry edit instructions. HTH Lars220. I use Winaero tweaker which simply sets the registry to use the wide scrollbars (instead of doing it yourself). It doesn’t work in Settings…still very narrow and disappears. I try not access Windows Settings because of this. But the registry edit to make them always visible doesn’t work in 1709. It has no effect but thanks anyway! I’ve delayed upgrade to 1803 for almost a year now so soon I’ll be forced to install either 1803 or 1809 so the setting will be available then. Browse with Firefox, with the NoScript extension running. At every website you visit, click the NoScript button to see what is running in the background. You will see that 99.99% of all websites have Google scripts running quietly in the background; however, almost no one has Microsoft scripts running. In fact, I can’t remember ever seeing Microsoft scripts running except at a Microsoft website. This is a comparison of Google and Microsoft, not Chromebook and Windows. But I believe it is indicative of what you will find if you could peel back the covers on any Google activity vs any Microsoft activity. No one is in the same league as Google in terms of collecting people’s data, although Facebook is a distant second. Whether it be ios, macOS, Android, Linux, Windows or any other OS, Google is an unavoidable fact of on-line digital life. It’s been like that for years! so no news here.. I use Winaero tweaker which simply sets the registry to use the wide scrollbars (instead of doing it yourself). It doesn’t work in Settings…still very narrow and disappears. I try not access Windows Settings because of this. But the registry edit to make them always visible doesn’t work in 1709. It has no effect but thanks anyway! I’ve delayed upgrade to 1803 for almost a year now so soon I’ll be forced to install either 1803 or 1809 so the setting will be available then. I have 1803 and a combination of ‘do not hide scrollbars’ and winaero scrollbar width settings does work in Settings! Batten the hatches, snooping is about to get worse. In 1809, Micrososft includes a Your Phone app so users can pass data from their Android phone to their PC. Does this mean they have a pathway into some of Google’s snooping? To my mind the issue goes deeper than “can you trust Microsoft”. 1) Microsoft has employees. Can we be sure every employee with access to data will not be tempted to make a few dollars on the side? No matter how good their security, someone may find a way to exploit a weakness. In fact, the stronger the security, the more people become complacent as Christoper Boyce demonstrated. 2) Microsoft says no personally identifiable data are included. This does not rule out data are included that enables linking to other data that does include personally identifying information. And with every month ‘s updates they’re likely to slip something new into the mix so that if you go check your privacy settings, which had previously all been set to “OFF” you sometimes find that there are suddenly things “ON”. This month it was Paint 3D…Oh, look at that! It gave it’s self default permission to talk to Mama!. Heaven help you if you forget to check for 2 or 3 months. Reply To: Win10 “Activity History” — misnomer or snoop?